I have a major weakness for chocolate. If there is chocolate in the house I will find it and more than likely eat it. Luckily for me I was given my dad's high metabolism and I am constantly running around after my very rambunctious two and five-year-old. Thanks to a combination of these factors and the fact that 99 percent of the time I eat very healthy, I routinely indulge my chocolate cravings. I hate to admit it, but I have even been known to eat leftover chocolate cake for breakfast. Not the healthiest breakfast, but yummy none-the-less. Given my love of all thing chocolate the recipe for Milk Chocolate Marble Loaf Cake with Citrus Compote in the November issue of Better Homes and Gardens magazine caught my eye and looked like something perfect for my menu plan. This recipe has 9 ingredients in the cake and 5 in the citrus compote. The prep time is approximately 30 minutes and the bake time 65 minutes, and it makes 12 servings. I had no problems finding any of the ingredients at my local grocery store with the exception of the kumquats, which I left out. My disco era oven even with a oven thermometer never seems to bake consistently and my cake took 20 minutes longer than the stated recipe. I tented the cake after to the first 30 minutes to prevent burning and rotated the loaf pan halfway through the cooking time. The only oranges available at my local grocery store were seeded, which made the prep for the fruit compote slightly more time consuming than the time the recipe suggested. I also took off the skins from both the oranges and grapefruit. I find the texture of the skins unpleasant in many recipes. I followed the remainder of the recipe as written. The loaf cake part of this recipe turned out well. It was light and had a subtle chocolate flavor. 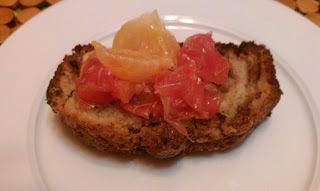 I wasn't as impressed with the combination of the loaf cake and fruit compote. Separately the fruit compote was delicious and my two sons loved eating it for breakfast by itself. When it was paired with the loaf cake it just seemed off. Both components were great on their own, but the combination didn't work. The loaf cake spread with warm butter was popular in my household and eaten quickly. My two boys loved the fruit compote as a fruit salad for breakfast, and ate all the leftovers. Overall, both components work well separately and therefore I would recommend eating them as two different recipes. For the recipe go to Milk Chocolate Marble Loaf Cake. Been waiting to see how that turned out! So was i more like a bread than a cake? When you said you spread butter on it, that is what made me ask. Thanks! This looks so good! Sounds like you and I have a nose for chocolate..I will also find any stash hidden anywhere in my apartment! Unfortunately, I do not have your metabolism! I can say I will be trying this recipe sometime. Thanks!